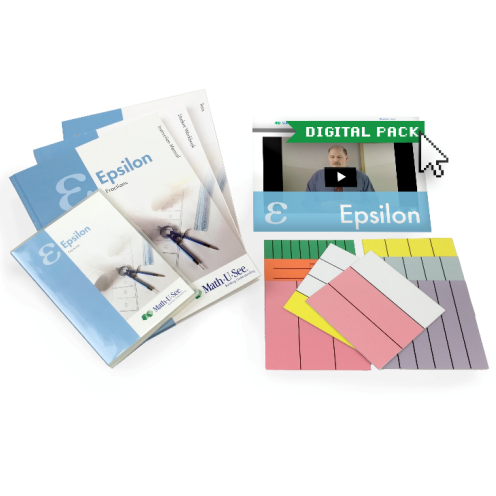 For this review, Caden was able to access and use a year long subscription to the Epsilon digital pack from Demme Learning for Math-U-See. He is currently using the level called Epsilon, which has a focus on fractions, in addition to many other topics. Since Caden had just begun working in the Epsilon book, this review came at the perfect time. We do own the DVD instruction disc, but I have found that being able to access the lessons on the computer has been a huge benefit. This is simply because I have 4 kids, who all use Math-U-See. That means every time someone has a new lesson, there is a scramble for the DVD player. Imagine my relief when Caden could simply go to the computer (or watch it on the ipad) for his new lesson instruction. Also included in the digital pack is the ability to access the manipulatives online. For Epsilon this is especially nice because the manipulatives are accessed by a simple click of the mouse. I find this much simpler to use. Caden did enjoy using the manipulatives online as he has completed his lessons each week. He spent a fair amount of time simply playing and exploring on the manipulatives site, which I thought was great. He was simply learning by playing, something that is so important for kids of any age! So far I'm very impressed with the Digital Pack from Demme Learning and Math-U-See. This is something that I will continue to consider purchasing each year as needed for my children. Math-U-See is a mastery approach math program. Each book focuses on one main concept for the entire book. Each lesson in the book focuses on one step or one aspect and then the concepts build on each other. The DVD (or digital) lessons are mainly for the parent to view. After they have viewed the lesson being taught, they can review the information in the teacher's manual. I usually have my kids watch the DVD lesson with me. After the lesson is taught or viewed, we do some practice problems. Each lesson contains 3 practice pages and 3 review pages. The students stay on the practice pages until they have demonstrated mastery of the new concept. Once the concept is mastered, the student moves on to the review pages. This is where all of the previous concepts that have already been mastered are reviewed in a spiral manner. For instance, in one of my son's Epsilon review pages, he also reviews some division problems as well as multiplication concepts like area and perimeter. Each review lesson consistently reviews mastered concepts to keep them fresh. The hands-on aspect of Math-U-See allows the students to visualize the math. They are also taught the WHY of math, not just the HOW. This is important to future math understanding and it helps them with higher concepts which are more abstract. Math-U-See slowly moves the student away from the concrete math to abstract math concepts. Students should use the manipulatives for as long as they need to. Most students put them away on their own. This ensures they have a really strong mental picture of the math processes. Want to read more reviews? Go to the Review Crew blog and read what the other reviewers had to say about this product.